I’m finding that my family is requesting some crock pot favorites from days gone by. This balsamic chicken is a proving to be a year round favorite for the entire family (which we all know is an added bonus when everyone loves the same dish). So for the previous stated reasons, I don’t think I have to tell y’all why I’m fixing this for dinner tomorrow. 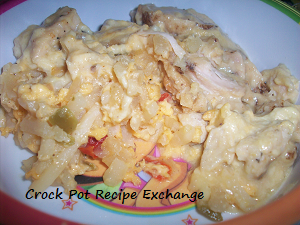 This is a great light chicken recipe that goes with almost any vegetable side. I am always trying to find a way to use Balsamic vinegar other than in salad dressings…. this is perfect for that! Cook on high 3 hours or low for 4 – 6 hours. 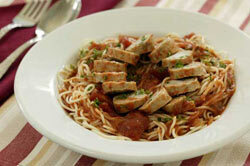 Serve over angel hair pasta and garnish with fresh parsley or basil. *NOTE*Careful not to overcook chicken breasts. If they, or any lean cut of meat, are overcooked, they become very dry. All crock pots seem to cook differently, so keep this in mind when timing your recipe. UPDATE 9/8/10: I just cooked this recipe in the crock pot last night and used chicken breast tenderloins, added 8 ounce package of button mushrooms-sliced and added a small can of sliced black olives.I also only used one can of crushed tomatoes instead of two. I only had to cook it on low for about 4 hours. OMG! I cooked angel hair pasta and topped it with the Balsamic Chicken… you talk about GOOOOOD! Even the two year old wanted seconds. 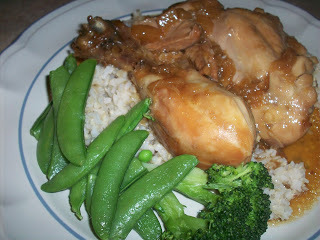 See Crock Pot Balsamic Chicken on Key Ingredient. 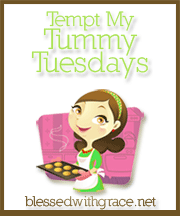 This recipe was shared at What a Crock, Family Food Fridays, $5 Dinners, Tuesdays At The Table, , Real Food Wednesdays and Momtrends Recipe Linky. It was also featured on Finding Joy In My Kitchen~Friday Favorites 09/03/10.